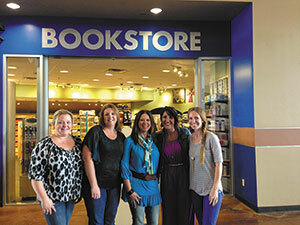 Denominational bookstore White Wing has expanded its presence to a Cleveland, Tennessee, mall. The move came about after first proving its success with a mall kiosk rather than opening a full store right away. 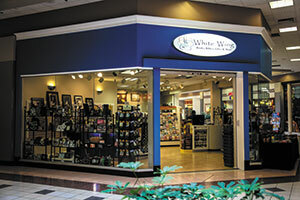 White Wing held a grand opening Aug. 16 for its new Bradley Square Mall store, which measures about 700 square feet. The store drew traffic with free food and a radio station remote event from 11 a.m. to 1 p.m.
“We stayed packed all day long,” said Rachel Cartwright, bookstore manager of the White Wing Christian Bookstore and White Wing mall store. Gene Browning, director of White Wing Publishing House and retail operations, said the Church of God of Prophecy’s 5,000-square-foot headquarters store has been serving Cleveland since 1968. “A lot more people from the community were coming in,” Browning said. “But we felt like, because we were at the denominational headquarters, that there were some people that still didn’t feel comfortable coming into our store. The mall store also draws Lee University students and other young people. “By going into the mall, we’ve exposed ourselves, our witness and these Christian resources to people who don’t normally shop at a Christian bookstore,” Browning said. The mall store is selling more titles from popular authors and top-10 books than the headquarters store does. The mall kiosk operated for just under two years but was closed once the permanent mall location opened. Sales success has followed. Gifts are the top-ranking sales category, followed by books and Bibles. Top-selling items include Kerusso T-shirts, books, Bibles, gifts and jewelry. Cards are also selling more with a more expansive DaySpring display. The store also has a new P. Graham Dunn laser engraver and a wide variety of products to personalize. “We gave away silicone wristbands that we personalized for free that [grand opening] day,” Cartwright said. 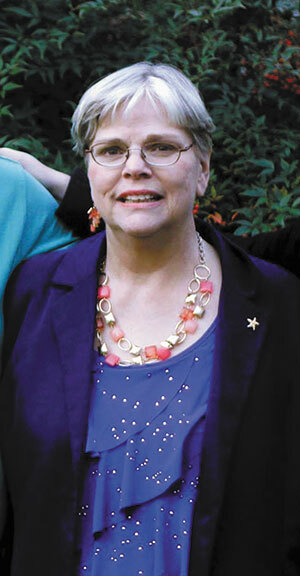 Sagemont Bookstore welcomed Becky French as the new director of the bookstore and café in June. A retired high-school English teacher, French assumed her new role in June after responding to an advertisement in the church bulletin at Sagemont Church in Houston. From working at a bookstore in college and serving as a missionary in Japan to teaching, enjoying good books and discussing the truth of God’s Word, French’s background and skills have helped to prepare her for the new post. French saw the opening in the bulletin while visiting her daughter’s church. The store has one full-time employee—the director—and one part-time employee. Additionally, the bookstore and café are staffed by a volunteer team of about 30 to 50. The store is open six days a week, serving a church membership of more than 19,000 as well as surrounding communities. Led by Senior Pastor Dr. John Morgan, with two Sunday services, the church sees an average of 6,000 attend each week. In French’s new position, she hopes to continue to successfully support the store and its ministry. She brings to the role a desire to learn new things and discuss ideas with the store’s customers. In its 10th year, the 2,500-square-foot Sagemont Bookstore stocks a mix of books, Bibles, greeting cards and gift items. The store’s best-sellers include Bibles, church-branded T-shirts and jewelry. The café occupies an additional 500 square feet. New Hope Church Bookstore in Manvel, Texas, depends on a committed team of volunteers to keep its store operations running smoothly. With a team of about 70 regular volunteers, Terrill said several factors contribute to the store’s low turnover rate. The church store recruits recruit volunteers, typically by word of mouth. After a volunteer is recruited, they fill out paperwork, complete an online orientation and go through formal training, then the volunteer works with a team leader who is an acting manager. The store uses a hands-on training process, and volunteers spend the most time learning how to help shoppers select a Bible and working on the store’s point-of-sale system. Initially, a volunteer will work as a greeter, then will graduate to the P.O.S. Terrill said the store looks for individuals who are friendly, outgoing and helpful. New Hope is a multi-site church with three stateside campuses—the 288 Campus, Alvin Campus and East Campus—as well as one in Haiti. Each U.S. campus has a store, which range from approximately 200-1,000 square feet. Combined, the church has 11 services each weekend, and each service has a different set of volunteers for the store locations. To keep turnover down, Terrill and her team operate under these guidelines: Schedule volunteer time to coincide with when volunteers attend church; listen to their story and help them serve in an area that best suits their gifts; have volunteer team leaders that act as liaisons between church staff and the volunteer team to share information about new products, weekly promotions or resources that complement the weekend lesson; schedule annual P.O.S. training; offer volunteers a store discount as a way to thank them; and be sure to have fun. 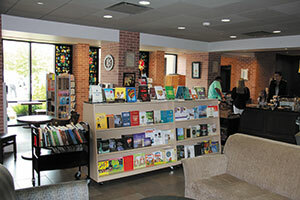 The Bookstore and Coffee Shop at Houston’s Chapelwood United Methodist Church is refreshing its look. The store has been given a boost with slatwall to hang wall art and a modern core-board menu sign above the café counter. “The bookstore was designed so it’s also available as a seating area when the bookstore is not open, so I have bookcases that have glass doors on them that close and lock. The wall of the bookstore is a tile wall that curves in, then has the coffee shop cut out with a counter area,” said Kris Jodon, bookstore manager and librarian. Prior to the redesign, the flat tile wall had a menu on it, but that left little or no room to display wall art, which sells well at the store. With the renovation, the menu was removed from the tile wall, and the space was covered with approximately 15 feet of slatwall for the display of wall art with products from vendors like P. Graham Dunn, Carpentree and Glory Haus. Jodon said the new and improved 3-by-5-foot café sign will work better because the menu is positioned above the counter directly in front of customers who are ordering. She collaborated with the church’s communications department to create the new menu sign. The store uses signage and placement to showcase the books and studies that are planned or are in progress at the church so people can find what they need to participate. The floor plan for the store and coffee shop includes an approximately 720-square-foot area. The space features an espresso-drinks bar, nine bookcases, a center display area that can showcase 90-100 books face out, three small slatwalls, a Kerusso T-shirt spinner, a book spinner and three card spinners. The manager described the store as a warm community space. It is an open space that remains usable even when the bookcases are closed and the gifts are put away. Team members also pray with and minister to their customers. Chapelwood has five worship communities—Mercy Street, Center for Christian Spirituality (contemplative), Upper Room, three Sanctuary services and Esperanza—each unique and serving somewhat different congregations. The communities bring a variety of customers into The Bookstore and Coffee Shop—and the need for a variety of products. Vineyard Columbus Bookstore in Westerville, Ohio, recently reached out to members of their community to provide a job-training program for the disabled. Teaming up with Central Ohio’s Greenleaf Job Training Services, the store was able to train several individuals in the work of a bookstore clerk. Bookstore Ministry Coordinator Jeff Baker said he and his staff were able to offer job training skills, which included dusting and cleaning the store, alphabetizing books by author’s last name, burning sermon CDs and mastering basic computer skills. Greenleaf is a for-profit social enterprise that serves a niche segment of the Ohio population. The organization’s clients include veterans, individuals with learning disabilities, those who have suffered traumatic brain injuries, people with visual or hearing impairments and others who face significant barriers in gaining employment. “I thought this was a good way for us to reach out to our neighbors and to be a light in the community,” Baker said. Baker and his staff worked with each individual and his or her job coach. Each training period lasted two weeks, but didn’t require a lot of time from the manager. The 3,200-square-foot store typically employs one full-time staff member along with four part-time clerks. A team of 37 volunteers assist the store staff. “The main role of our bookstore clerks is to have a heart for discipleship and the gift of hospitality, to be warm and welcoming to people who come into the church and into the bookstore,” Baker said. The Loft Café & Bookstore in Jacksonville, Fla., now occupies a new facility—a move necessitated by the expansion of Celebration Church. After the 2013 move, the church campus doubled its seating capacity to about 3,000. Trevor Olesiak, The Loft Bookstore & Café Director, said the store operated in a 250-square-foot space on the old campus. The new store-café operation “was something that was designed and built in a three- to four-month period, and that really speaks to our incredible designer, so we’ve been operating in this new location for a little over a year,” Olesiak said. The store and café share the same space, and a storefront roll-down gate leads into the church lobby. The café and store share the same colors, with uniform cabinetry and mobile fixtures. The store has a youthful, nontraditional feel. Unlike many stores, there are no endcaps, for instance. “It’s all cabinetry and shelving that was designed to fit within the environment and theming,” he said. The store is named The Loft because the space is two stories with an upstairs area. The second floor features open seating for about 250. “It allows us to do cool events and things like that, from author events to summer movie nights,” Olesiak said. One recent example was the launch of The God-First Life (Zondervan), the latest from the church’s pastor, Stovall Weems. The Loft is primarily open Sundays and Wednesdays to meet the church’s needs.